BillHustonBlog: Adrian-- Do you *REALLY* want to Resist Trump? Adrian-- Do you *REALLY* want to Resist Trump? Now, do you REALLY want to resist the Trump agenda? Or do you want to REPEAT THE SAME FAILED STRATEGIES which brought us Trump? Then READ THIS and I will explain how these "Resist Trump" groups (and there are dozens) are being organized by the SAME PEOPLE who gave us Trump to being with! Here's a list of a bunch of them. There could be hundreds! If you've lived in NY, you will no doubt be familiar with how Citizen Action works with Working Families Party. c) Capture the "Protest Vote" which might go to a Socialist, Green, or Libertarian, and give it to the corporate candidate. 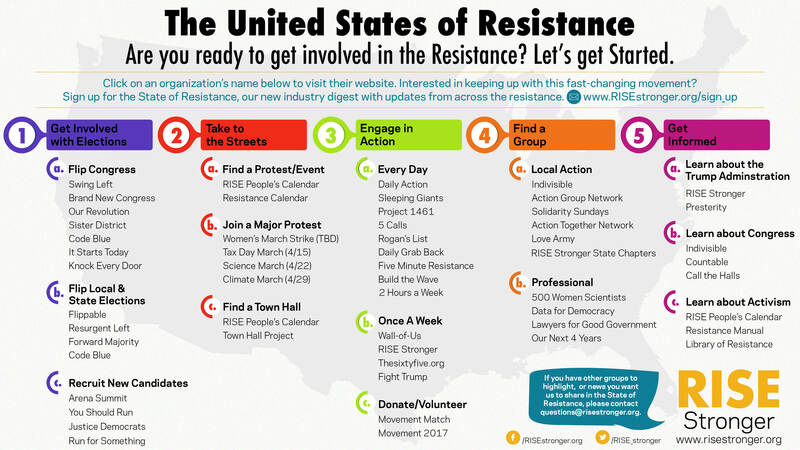 To join an Indivisible group, you must PLEDGE ALLEGIANCE to their "resist Trump" strategy. They DO NOT propose a legislative agenda based on positive, shared values! »» Donald Trump's agenda will take America backwards, and it must be stopped. of inclusion, tolerance, and fairness. As discussed in the second chapter, we strongly recommend focusing on defense against the Trump agenda rather than developing an entire alternative policy agenda. Defining a proactive agenda is time-intensive, divisive, and, quite frankly, a distraction, since there is zero chance that we as progressives will get to put our agenda into action at the federal level in the next four years. She also FAILED TO PROMOTE ANY AGENDA based on positive, shared values, like Bernie was doing. She was (her camp were) only ATTACKING TRUMP. 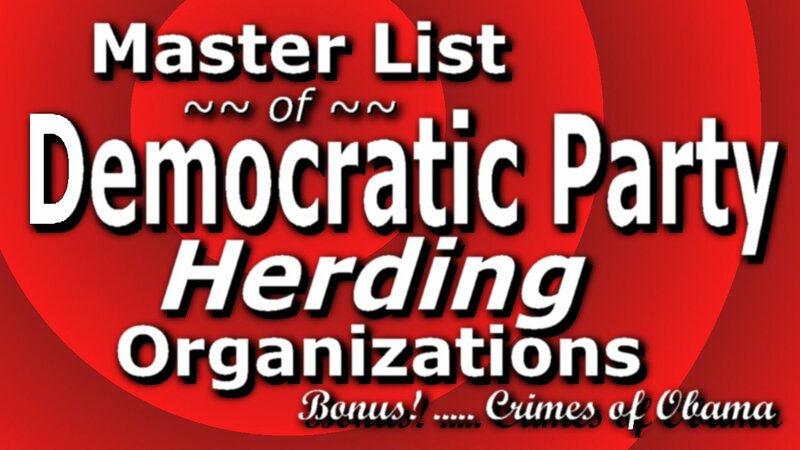 So now Indivisible, and all these other Democratic Party Herding Organizations are REPEATING THE SAME FAILED STRATEGY which cost Clinton the Election!!! 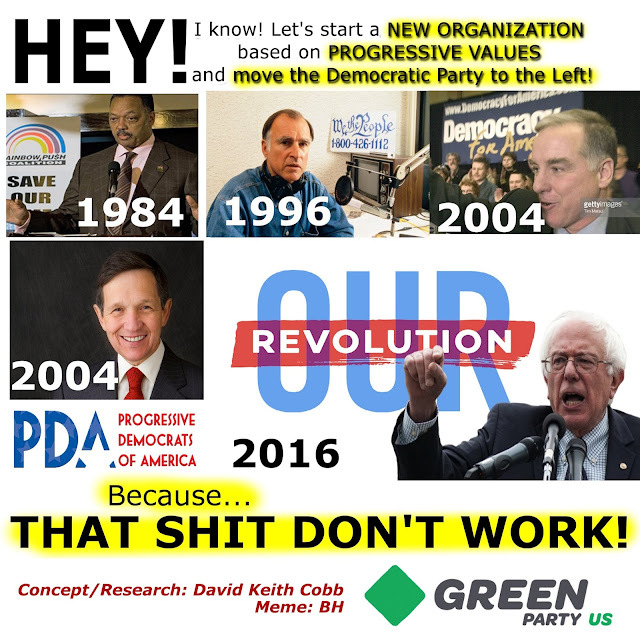 Convince people that YOU MUST only work within the confines of the SAME FAILED, & WIPED OUT Democratic Party which created this crisis. Don't you think it's time to TRY SOMETHING DIFFERENT? Action Hub - What Do I Do About Trump? bombs and drones and grenades and guns and paid mercenaries. Murdered 1M people, displaced another million. Kicked 10 million families out of their house in forclosure crisis? Offshore drilling permits? Castrating the EPA? Canceling the investigation into the harms of fracking during election year? All of the Above energy plan? "Clean Power Plan" which replaces electricity from dirty coal with dirty fracked gas? No help for Flint Water Crisis? Charter Schools, and High Stakes Testing (Common Core)? Left wing gov't with right-wing policies? An illegal tax disguised as healthcare? (Romneycare with no public option?) Tried to cut SS & Medicare? Auctioning off Public Lands for commercial exploiaton? Nearly 3/4ths of Keystone Pipeline System built? Failed to help striking teachers in Wisconsin? Failed to fulfill his promise to shut down TORTURE facility at Gitmo? Extrajudicial kill lists for American citizens? Undeclared wars against 7 nations? Regime change in Libya, and Syria causing one of the greatest mass migration crises in history? Or murdering a million people in seven countries via bombs, drone strikes, covert actions, and proxy wars? Announcement: Summit meeting of activists in 19th CD, 8 July, Hudson, NY. I've been asked to forward this to the lists, as the meeting is an open one, though registration and fee required. Details below. I am forwarding an invitation to an Activist Summit in Hudson. I hope you will be able to participate. Please forward to anyone you think would be interested. As a leader in the Resistance Movement, you are invited to join us for a day of education, organization, collaboration and resistance training on July, 8, 2017 at the beautiful Upjohn Mansion/Hudson Lodge, located at 601 Union St., Hudson, NY. It will be a unique gathering of activists, trainers and teachers from CD19 as well as many supporters from neighboring Blue Districts and promises to be a full and rich day. Linked is a registration form that includes a brief outline for the day and also your lunch preference, which is included in your registration fee. Filling this out as soon as possible will help us to prepare a well organized and effective event. This is an all volunteer effort and your cooperation and speedy response will be tremendously helpful and appreciated. If you are able to sponsor another activist for whom the fee is a barrier, please indicate that on the registration form. If the $35 fee is a barrier for attendance, please contact me. We will be creating an introductory video of the great work that is happening all over CD19 to start the day, if your group would like to participate in that via Skype or Face Time, please also indicate that on the registration form. Our email list is is not complete. Please share this with other activists that you think would be helpful. We are strongly recommending that all participants read On Tyranny: Twenty Lessons from the Twentieth Century. Keep the faith - now more than ever. Apologies if you receive this more than once, we have collated a number of lists, a living, changing document which we will be happy to collaborate with other organizations to perfect and then share (SPOILER ALERT - that's part of a break out! ).